Hello! Attached you will find a picture of our GSD, in this picture she is 9 months old, she turned a year in January. We also own a black cat named Max. Max went missing for a few days and we had almost given up on him, until one night Maggie insisted on going outside and found him in our front yard. We are so lucky to have Maggie in our lives. I am asking that you consider Maggie for the GSD of month for April. Hello MELISSA, what a great German Shepherd puppy story. 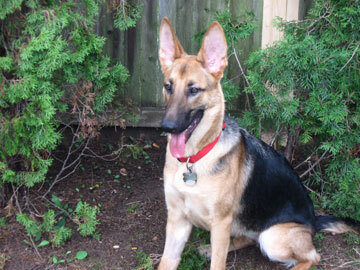 And thank you so much for sharing your great rescue story about your wonderful German Shepherd puppy Maggie. And what a wonderful picture - I really love it! She is so pretty! And a great name too. I always loved the name Maggie - one of my favorite dog names still. She is absolutely adorable however - keep up the great work. A great story. My family just added an 8 week old female GSD and her name is Bree. I hope to meet her in less than two months(I am on deployment). If she is anything like yours I am gonna have a great time with her. Again, a wonderful story. I would definitely nominate her for GSD of the month! Great job Maggie. You made your owners proud.